Hello followers, welcome to our first-ever blog post! Blogging is a new venture for us so we are very excited to communicate with our supporters in this way. We hope to post roughly once every month so keep an eye out for our updates. Our first post is dedicated to sharing the recent happenings at New Beginnings – please enjoy! This is Barbra; and here’s her story of resettlement. Exactly one year ago from this month, New Beginnings faced the death of another young child. This little girl was Barbra’s sister, Esther. Esther’s death was terribly unexpected, and while it has been difficult to understand why such a thing can happen, we trust that God has a plan and that His timing is perfect. After Esther’s death, her mother, who abandoned her daughters because she was jobless, made her way to New Beginnings village. She was heartbroken to hear of her daughter’s passing and spent time mourning with her other three daughters, Barbra, Deborah, and Sharon at the village. After some time we discussed the possibilities for this family. 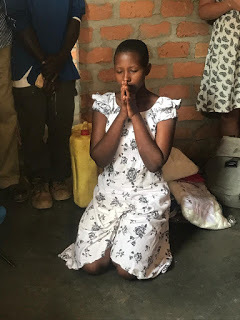 The Summer teams were able to raise enough funds to build a house for the family and in July 2018, the team built Esther’s mother a house, provided her with a goat, seeds and tools to farm a small patch and the opportunity to open a shop from her house. Esther’s mother is now living a comfortable life where she is able to provide for her three daughters. Barbra and her sisters have been reunited with their mother and are overjoyed to have a family. The girls stay at New Beginnings during their studies and return to their home on holidays. In the midst of despair, God is always there. When we, as Christians, face our personal struggles and times of trial, we must be reminded of God’s presence, his endless love and trust in Him. Resettlement: We are pleased to say that our Resettlement Officers are working hard to trace relatives of children in our care with the hope to resettle them with their relatives, if and where possible. Resettlement is a very challenging task and requires a lot of work and time. Our next update will include a follow up on our resettlement progress. We ask that you pray for the children who are currently preparing for resettlement and the staff who attempt to trace their relatives. Education: We currently have 192 children in the care of New Beginnings children’s home, with an additional 107 children going through education at New Beginnings Primary School. The school is doing well and presenting extremely promising results. The pupils returned to school in February after their eight weeks holiday; they are motivated for the new term and are continuing to work hard. We are delighted to inform you that all primary seven pupils passed their National Leaving exams and have been promoted to Bethel Royal High School. The two dormitories built by Hope Builders last year are now filled with boys and girls from the community and New Beginnings who are boarding at the school. Some of these children used to walk two hours to get to school and two hours home; now they can stay on the school grounds and focus on their studies after school hours. Self-Sufficiency: The water project installed in 2017 with the help of TNA continues to be a huge asset to New Beginnings. Our water supply is now enough to provide for the home, the school and the local community. For this we are extremely thankful. The farm is developing every year with new crops being grown, aiding the village in self-sufficiency. However, there was no rain during the second season last year which has put some pressure on our budget. The farmers are planting sweet potato, Irish potato, cassava, maize and pumpkin at the minute, with the help of the children on the weekends. Children: Unfortunately, we do face times of sickness among the village. As many of you know, Joseph, aged 12, was diagnosed with cancer early last year. This is not an easy situation for anyone, never mind a young boy. Through the generosity of our sponsors, Joseph has been receiving the care he needs and by the grace of God, we are so thankful to inform you that Joseph is responding well to his chemotherapy treatment! Joseph is still attending hospital regularly to receive treatment; we appreciate all your prayers towards his health and ask that you continue to pray for his upcoming treatment. As you may be aware New Beginnings cares for a number of children with special needs. Although this can be very challenging it is also extremely rewarding especially in the case of Wilson. Wilson has many ailments and was taking multiple epileptic attacks. As Wilson is unable to communicate fully, he was unable to tell of his pain. After examinations it was discovered that his attacks were being triggered by extreme pain from a dislocated hip. New Beginnings made arrangements with the team at CORSU rehabilitation centre for Wilson to have an operation as he was getting more and more depressed as the pain increased. He stopped eating which put the operation at risk. After much counselling and encouragement, we were able to take Wilson for his operation and he is now going through rehabilitation. He started to smile again and talk for the first time in months! Elkana lives with his mother in the Nakasongola community, surrounding New Beginnings. Elkana has cancer in his eye and is receiving treatment through New Beginnings. His mother says he is improving each day and she is very thankful to New Beginnings for the support given to treat her boy. Through the kindness of our sponsors, and by the grace of God, we are blessed to be able to help vulnerable children like Elkana and their families.